FOR IMMEDIATE RELEASE: Santa Barbara, CA January 11th, 2014 – The University Club Leads Group is having a special luncheon for new visitors on January 29th, 2014, at 12:30 to 1:45 pm, at the University Club located at 1332 Santa Barbara St., Santa Barbara, Ca. 93101. Are you serious about growing your business? Leads Club has a proven system that has helped entrepreneurs worldwide prosper. CONNECT with people serious about business, COLLABORATE using a proven referral system, PROSPER with new customers and clients. Results Oriented. Chapters report monthly to their Regional Office the number of referrals, or Leads passed. Thus far millions of Leads have been exchanged by Members generating billions of dollars of new business. Results for individual members are monitored by periodic questionnaires to Members. The latest survey showed a 19 – 25% average yearly increase in sales within the first year of membership. $19.00 for a lunch on the day of your visit, and $5.00 without lunch. Contact: Barbara Reaume at [email protected] or 805-610-5403, for a reservation. About Barbara Reaume: Barbara Reaume is a professional Santa Barbara and Montecito realtor with over thirty years of experience. Montecito realtors such as Barbara Reaume help home buyers and sellers navigate the complex real estate process by specializing in Santa Barbara relocation, luxury houses for sale, home buying tips, Montecito relocation, Montecito homes for sale, Santa Barbara homes for sale, Carpinteria real estate, house staging tips and short selling a home on a budget. 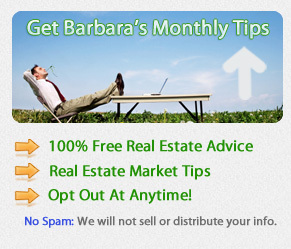 At her web site, Barbara offers a free guide entitled “12 Smart Questions To Ask Your Realtor”; http://www.BarbaraReaume.com. For help with your Santa Barbara relocation strategy visit her website and get relocation tips on her Facebook page. Call (805) 610-5403 for more information or to request a new listings report. This is an interesting event and a very beneficial one to entrepreneurs. Networking and connecting with people is an important recipe to success. I thank Montecito Realtor Barbara Reaume for sharing this information.